In the summer of 1972, at Andrews Air Force Base outside of Washington, D.C., the Eighty-Ninth Military Air Wing took delivery of a new, specially outfitted Boeing 707 aircraft. Over the next twenty-eight years the plane would fly 445 missions, 1,440 sorties, and over 1.3 million miles. It would literally fly in and out of history as it ferried seven different Presidents to the events and places that would shape the world. To the military, the plane was known as “Special Air Mission 27000.” To the world it was—and always will be—AIR FORCE ONE. On September 8, 2001, the Air Force decommissioned SAM 27000 and gave it on permanent loan to the Ronald Reagan Presidential Library in Simi Valley, CA. Documentary filmmakers Joel Haskell Cohen and Michael Cohen have chronicled the historic final days of the most famous aircraft in the world. The Cohen’s cameras were rolling from the moment SAM 27000 touched down for the final time at San Bernardino International Airport in California where it was disassembled piece by piece in one of the more complex engineering projects in the history of modern aviation. 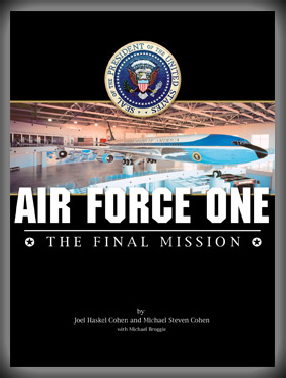 Air Force One: The Final Mission follows her perilous 102 mile midnight journey by truck to the Reagan Presidential Library where it was completely reconstructed in a massive new indoor pavilion. On October 21, 2005 they captured its rededication as a national historic treasure by President and Mrs. Bush and by Former First Lady Nancy Reagan. With stunning photography and personal insight and commentary from former presidents and former First Lady Nancy Reagan, Air Force One: The Final Mission tells the story of a triumph of engineering carried out through the sheer determination and patriotism of hundreds of men and women committed to preserving history. This is the story of AIR FORCE ONE: THE FINAL MISSION.